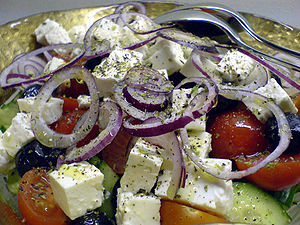 Greek salads, part of a heart healthy and anti-cancer Mediterranean diet are filled with greens, fresh herbs, tomatoes, cucumbers, olives, olive oil, nuts and a protein of your choice. Make this a vegan, vegetarian dish by adding beans or add grilled chicken breast or fish for a complete meal that you can put together in minutes. Oregano is a culinary herb with potent antioxidant activity and rich in essential oils that support normal digestive function as well as the plant phenols such as rosmarinic acid carvacrol known to be active against H. Pylori bacterial infections in the stomach, one of the primary causes of stomach ulcers. Oil of Oregano is well known for its effects on a wide spectrum of bacterial and fungal infectious organisms as well as its cancer fighting properties. Tomatoes are rich in the super antioxidant cancer fighting plant chemical lycopene. Olives and olive oil are rich in healthy monounsaturated oils. Purple and red onions are rich in quercitin, a flavonoid with anti-cancer activity. Add some pine nuts or walnuts for more essential healthy oils and your choice of beans or chicken or fish and you have meal in a bowl!